Little Russia (Mala Rus’, later Malorosiia). The name appeared in Byzantine sources at the beginning of the 14th century and was used for the church administrative unit covering the territory of the Principality of Galicia-Volhynia. In Byzantine documents and eparchy registers Halych metropoly (est 1303), consisting of six eparchies (Halych eparchy, Peremyshl eparchy, Volodymyr-Volynskyi eparchy, Kholm eparchy, Lutsk eparchy, and Turiv eparchy), was known as Micra Rosia (Little Rus’). From 1354 the name Macra Rosia (Great Rus’) was used for the 13 eparchies under the Kyiv metropolitan, namely, the Ukrainian eparchies—Kyiv eparchy, Chernihiv eparchy, Pereiaslav eparchy, and Belgorod eparchy—and 9 Belarusian and Russian eparchies. It was probably under the influence of Byzantine church nomenclature that Prince Yurii II Boleslav called himself Dux totius Russiae Minoris in a charter of 1335. Galician kings and princes usually used the title Rex Russiae, Dux totius terrae Russiae, or Dux et Dominus Russiae. The name Little Russia does not appear in 15th- or 16th-century documents. Only in the first half of the 17th century did it begin to be used in church correspondence between Kyiv and Moscow. Until almost the end of the 17th century the names Rus’ (Latin: Russia), Ruthenian land (Polish: Ziemia Ruska) and Red Rus’ (Latin: Russia Rubra) were used in chronicles and maps to designate western Ukrainian territory. The term Great Rus’, which had been applied originally to the eparchies of Kyiv metropoly, was used later to refer to the territories of Novgorod the Great and then Suzdal and Moscow, although until the 18th century those territories were usually called Muscovy in books and maps. Great Russia was used by foreigners, however, to designate the Ukrainian state of Bohdan Khmelnytsky, whom they titled Master and Hetman of Great Russia (1650). 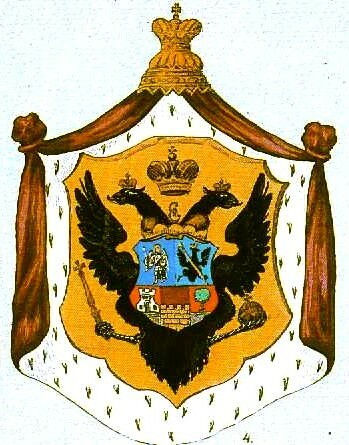 After the Pereiaslav Treaty of 1654 Tsar Aleksei Mikhailovich added to the usual title of the Muscovy tsars the phrase ‘of all Great and Little Russia.’ Later the term Little Russia (Malaia Rossiia or Parva Rossia), as the designation of the Ukrainian territory united with Muscovy, began to be adopted in Ukrainian official documents, chronicles, and literature. The name does not appear on the geographical maps of Ukraine published by the Russian Academy of Sciences in 1736–8 or in the Russian atlas of 1745. Malorossiia, which is derived from Malaia Rossiia, began to be used in official nomenclature in the 18th century to refer only to Left-Bank Ukraine, that is, to the Hetman state. In 1781 the Hetman state was abolished and replaced by Chernihiv vicegerency, Novhorod-Siverskyi vicegerency, and Kyiv vicegerency. In 1796 they were merged to form Little Russia gubernia (excluding Kyiv), which in 1802 was divided into Poltava gubernia and Chernihiv gubernia. The official terms Little Russia (Malorossiia), Little Russian (malorusskii), and Little Russians (malorossy) were used for Russian-ruled Ukraine and its inhabitants only in the 19th and at the beginning of the 20th century. Ukrainians living outside the Russian Empire were also called Little Russians. But the name Ukraine was also quite widely used in Russian scientific and literary publications. The name Little Russia was sometimes restricted only to Left-Bank Ukraine within the limits of Poltava gubernia, Kharkiv gubernia, and Chernihiv gubernia. After the Revolution of 1917 the terms Little Russia and Little Russian were dropped from general and official usage. Ukrainians did not approve of the term Little Russia, and it does not appear in Ukrainian folklore.